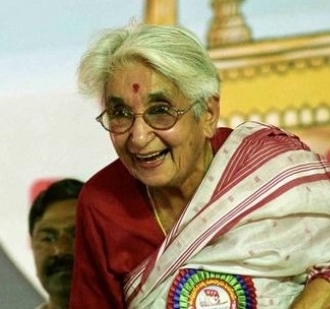 On July 19, 2012 Captain Lakshmi Sehgal suffered a heart attack at her residence in Civil Lines area, Kanpur. The 97-year-old, who as a young woman fought allied forces during World War II, breathed her last in a private hospital at 11:20 a.m. on July 23, 2012 due to her advanced age and multi-organ failure. Vice President Hamid Ansari and Prime Minister Manmohan Singh condoled the death of Sehgal, saying that the nation has lost an icon of selfless service. Who is this Captain Lakshmi? What is so special about her? A doctor by profession, as a young woman she fought allied forces during World War II leading the women’s wing of Netaji Subhash Chandra Bose‘s Indian National Army. An activist. She was born as Lakshmi Swaminathan on October 24, 1914 in Madras, Madras Presidency, British India, to S. Swaminathan, a lawyer who practiced criminal law at Madras High Court and A.V. Ammukutty, better known as Ammu Swaminathan, a social worker and independence activist from the prominent Vadakkath family of Anakkara in Palghat, Kerala who later became a member of independent India’s Constituent Assembly. Lakshmi observed how the fight for political freedom was fought along the struggle for social reform in the South. 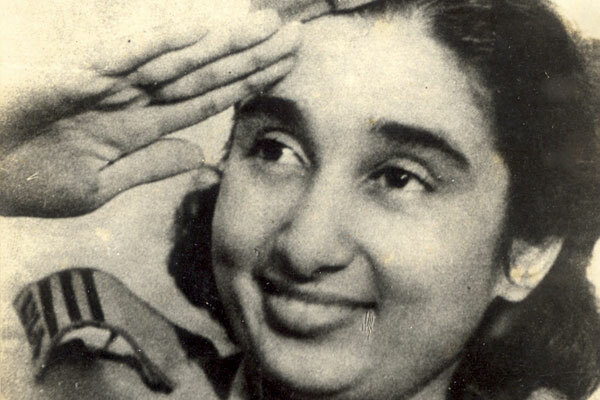 Her mother, a Madras socialite became an ardent Congress supporter. One day she walked into Lakshmi’s room, took away all the child’s pretty dresses to burn in a bonfire of foreign goods. Lakshmi also saw campaigns for political independence waged together with struggles for temple entry for Dalits and against child marriage and dowry. Even as a child, Lakshmi had a rebellious temperament. One day at her grandmother’s house in Kerala, she walked up to a young tribal girl, held her hand and invited her to play with her. Though her conservative grandmother was extremely angry with her, Lakshmi faced it bravely. It was her first rebellion against the humiliating institution of caste. After high school in Madras, Lakshmi obtained her MBBS degree from the Madras Medical College in 1938. A year later, she received her diploma in gynaecology and obstetrics. She worked as a doctor in the Government Kasturba Gandhi Hospital at Triplicane Chennai. Two years later at the age of 26 she left for Singapore after the failure of her marriage with pilot P.K.N. Rao. In 1942, Britain and its allies had imposed a trade embargo on Japan in response to its continued campaigns in China. Seeking alternate sources of necessary materials for its Pacific War against the Allies, Japan invaded Malaya. Singapore was the major British military base in Southeast Asia and nicknamed the “Gibraltar of the East”. The Japanese saw Singapore as a port which could be used as a launch pad against other Allied interests in the area. 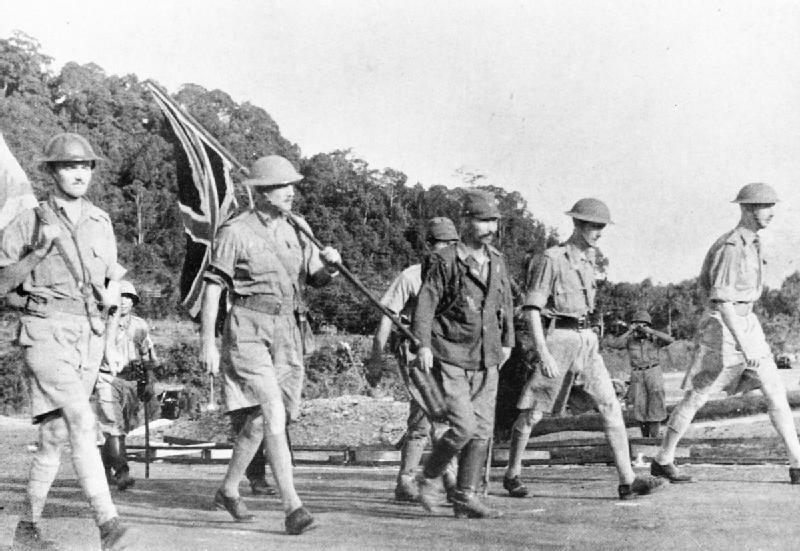 15 February 1942 – Lieutenant-General Percival and his party carry the Union flag on their way to surrender Singapore to the Japanese. Left to Right: Major Cyril Wild (carrying white flag) interpreter; Brigadier T. K. Newbigging (carrying the Union flag) Chief Administrative Officer, Malaya Command; Lieutenant-Colonel Ichiji Sugita; Brigadier K. S. Torrance, Brigadier General Staff Malaya Command; Lieutenant General Arthur Percival, General Officer Commanding, Malaya Command. The Empire of Japan invaded the Allied stronghold of Singapore on February 9, 1942. The fighting lasted a week. In just seven days, Singapore, the “Impregnable Fortress”, fell to the Japanese that resulted in the largest surrender of British-led military personnel in history. About 80,000 British, Indian and Australian troops became prisoners of war, joining 50,000 taken by the Japanese in their Malayan Campaign. Lakshmi attended the wounded prisoners of war, many of whom interested in forming an Indian liberation army and young Lakshmi got drawn to the freedom struggle to liberate India from the British rule. At this time in Singapore, there were many nationalist Indians like N. Raghavan, K. P. Kesava Menon, S. C. Guha, and others, who formed a Council of Action. The aim of their Indian National Army (INA) or Azad Hind Fauj was to liberate India from the British occupation with the help of the Japanese. Initially composed of Indian prisoners of war captured by Japan in the Malayan campaign and at Singapore, it later drew volunteers from Indian expatriate population in Malaya and Burma. However the INA received no firm commitments or approval from the occupying Japanese forces about their participation in the war. At this juncture the arrival of Netaji Subhash Chandra Bose in Singapore on July 2, 1943 ended this moratorium. In the next few days, at all his public meetings, “Netaji” spoke of his determination to raise a women’s regiment which would “fight for Indian Independence and make it complete”. 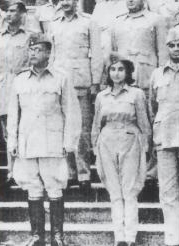 Lakshmi met Netaji in Singapore and had a five-hour interview that resulted in a mandate to set up a women’s regiment, “the Rani of Jhansi regiment. 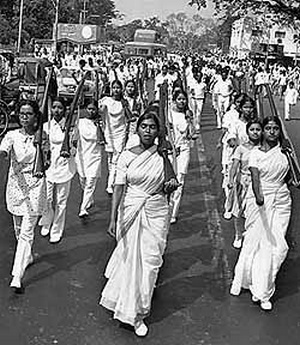 ” There was a huge response from young women to join this all-women brigade and Dr. Lakshmi Swaminathan became Captain Lakshmi, a name and identity that stayed with her for life. In December 1944, the march to Burma began. In March 1945, just before the entry of their armies into Imphal, the INA leadership took the decision to retreat. In May 1945, the British army arrested Lakshmi. She remained under house arrest in the jungles of Burma until March 1946. She arrived in India amidst the popular hatred of colonial rule, intensified by the INA trials in Delhi. In March 1947, Captain Lakshmi married Col. Prem Kumar Sehgal, a leading figure of the INA. The couple moved from Lahore to Kanpur, where she plunged into her medical practice, working among the flood of refugees who had come from the newly formed Pakistan. She earned the trust and gratitude of both Hindus and Muslims. Even at the age of 92, she saw her patients every morning. 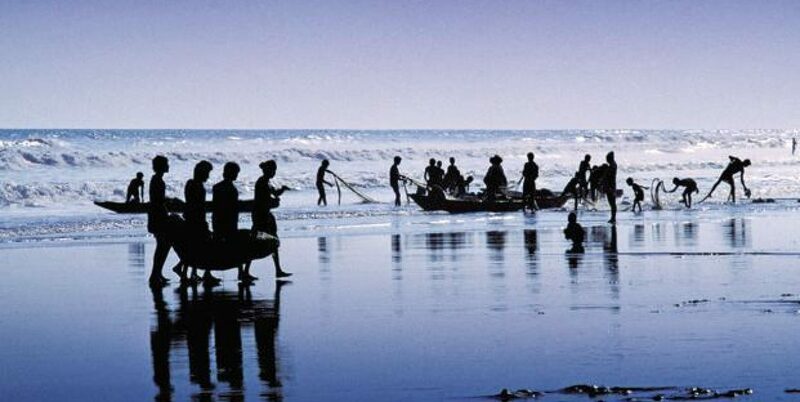 The Bangladesh Liberation War started on March 26, 1971 between the State of Pakistan and East Pakistan. India intervened on December 3, 1971. Armed conflict ended on December 16, 1971 resulted in the secession of East Pakistan, which became the independent nation of Bangladesh. Refugee camps were set up in the border areas in West Bengal. Lakshmi’s daughter Subhashini had joined the CPI(M) in early 1970s brought to her mother’s attention an appeal from Jyoti Basu for doctors and medical supplies for Bangladeshi refugee camps. Captain Lakshmi left for Calcutta, carrying clothes and medicines, to work for the next five weeks in the border areas. After her return Lakshmi applied for membership in the CPI(M). For the 57-year old doctor, joining the Communist Party was “like coming home.” “My way of thinking was already communist, and I never wanted to earn a lot of money, or acquire a lot of property or wealth,” she had said. Captain Lakshmi was one of the founding members of All India Democratic Women’s Association (AIDWA) formed in 1981. She later led many of its activities and campaigns. After the Bhopal gas tragedy in December 1984, she led a medical team to the city; years later she wrote a report on the long-term effects of the gas on pregnant women. She was out on the streets in Kanpur, during the anti-Sikh riots that followed Prime Minister Indira Gandhi’s assassination in 1984, confronting anti-Sikh mobs and ensuring the safety of Sikh or Sikh establishments in the crowded area near her clinic. In 1996, she got arrested for her participation in a campaign by AIDWA against the Miss World competition held in Bangalore. In 2002, the Left fielded Captain Lakshmi as their presidential candidate against Dr. A. P. J. Abdul Kalam. During her whirlwind campaign across the country, she addressed huge crowds at public meetings. She frankly admitted that she did not stand a chance of winning and she used her platform to publicly condemn a political system that allowed the growth of poverty and injustice.